Mounting Brackets, Exhaust Port Gaskets, Hardware are still available. *Please note the race system does not retain the passenger pegs*. *New Aluminum Mounting Bracket now has a Brushed Satin finish*. For those wanting a slighty quieter version, we now offer the Long Quiet Core Muffler option. Fits 2008 - 2012 models. The new Area P Mid-High Mount Race System is specifically designed for maximum performance when utilizing a modified air box/filter and/or removal of the OEM airbox (replace with K&N Dual Flange Oval Air Filter & Crankcase Breather Element), along with Area P/Dynojet Kit. 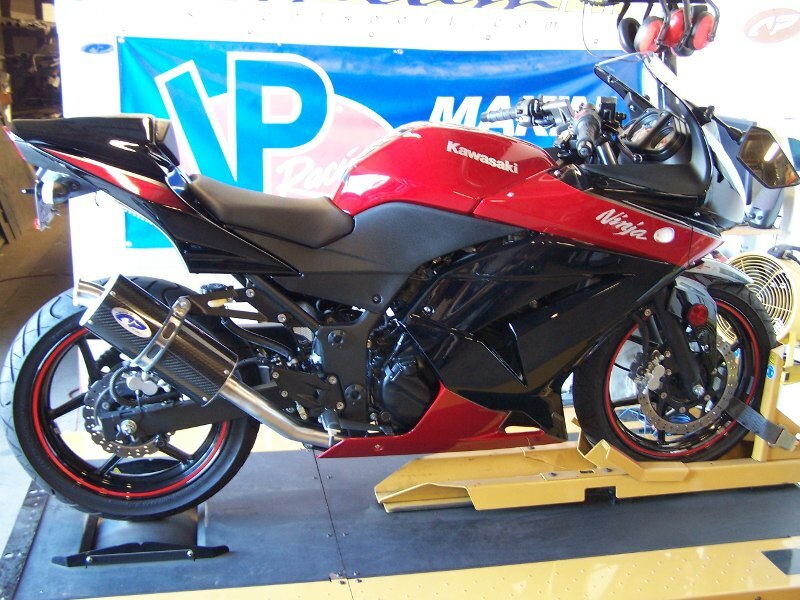 The primary R&D goal was increased throttle response and peak power with a modified air intake. To take full advantage of the increased intake flow, the head pipes and mid-pipe are much larger and stepped, as is the true 2-1 merge collector. Special lightweight 304 series stainless steel tubing is utilized throughout. Welded sections are meticulously fitted and assembled with hand-crafted Tig welding. 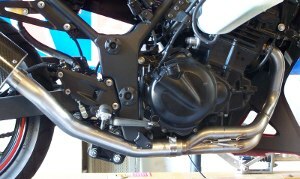 Race inspired slip-fit, spring mount junctions are utilized at the head pipe to merge collector, along with a mid-high mount exit location for maximum clearance and style. Attention to stepped and overall tuned length sections is essential when utilizing large diameter tube designs on high reving 4 stroke engines. The R&D program encompassed 6 different prototypes, 68 dyno runs and 11 jetting changes. 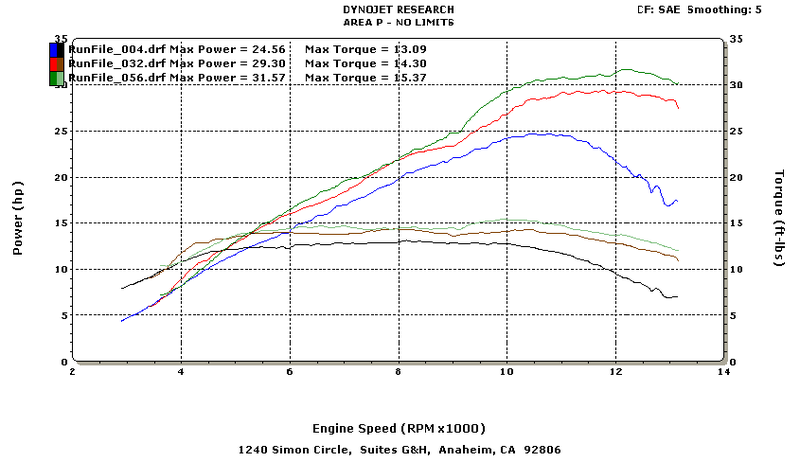 Throttle response and power is increased from 3000 rpm to 12250 rpm. 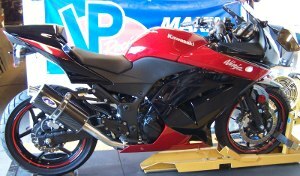 The primary focus was maximizing throttle response and power band after 8500 rpm. 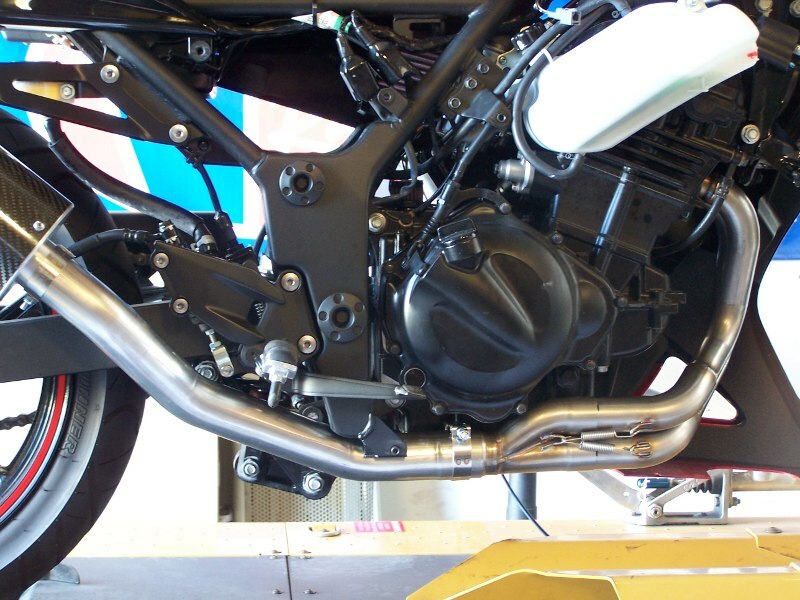 The Mid-High Mount Carbon Fiber Muffler includes a new Brushed Aluminum Mounting Bracket (no longer black powder coat as pictured) that replaces/removes the OEM passenger pegs. Massive power increase and weight savings. Detailed Installation/Tuning manual, stainless steel mounting hardware and Area P designed exhaust port gaskets are included. 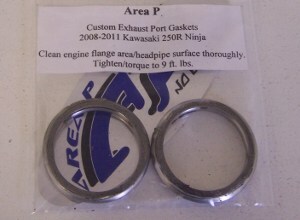 Our new Area P exhaust port gaskets feature additional “crush volume” for superior sealing. *11/24/14 - All systems now come standard with our Flat Conical Billet End Cap. To view our new Flat Conical Billet End Cap, go to our "Custom & Universal" web page. Dynojet Jet Kits - We highly recommend rejetting for optimum performance and throttle response. 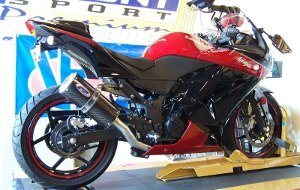 We stock Dynojet Kit # 2193 for oem airbox/exhaust combination ($79.95). If removing the airbox and utilzing a K&N type Flanged Filter and/or racing, we recommend the Area P Customized Dynojet Kit #2193R which includes three additional sets of main jets, stainlesss steel allen head screws for carb top caps and float bowls, and allen wrench ($94.95). 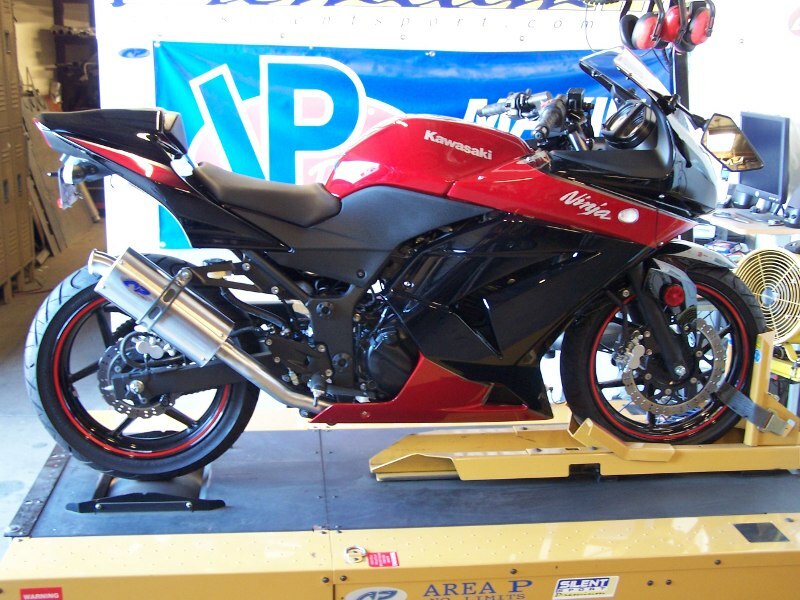 The Race System is expressly designed to produce the best overall power with lowest possible sound level utilizing our 18” long muffler within its tuned length. Coupled with our high percentage stainless steel perforated core, it produces a deep, low frequency exhaust note that is unique to this system. 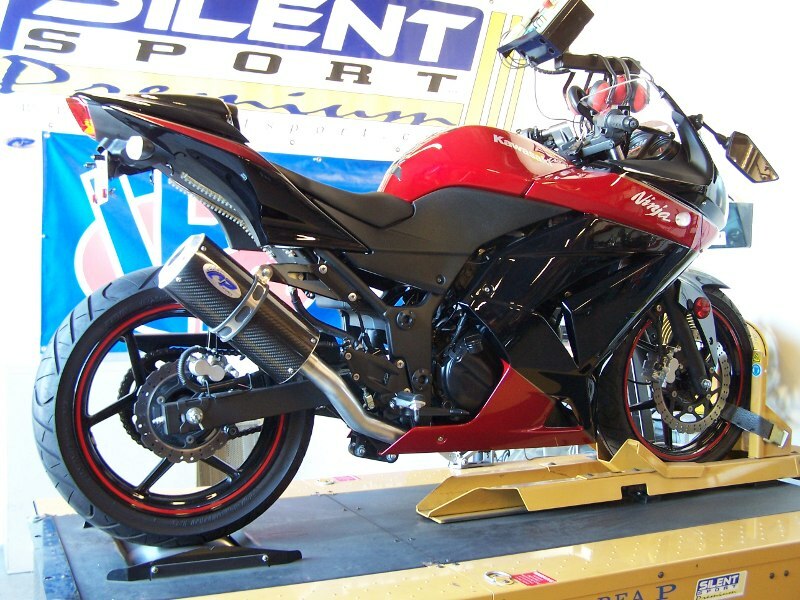 *Note – A shorter 12” long muffler is available in carbon fiber or stainless steel, but will slightly reduce peak power, while increasing sound levels 6 - 8 dbA. Flat Conical Billet End Cap will slightly increase the exhaust tone as well. 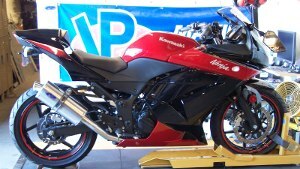 Test bike was a 2010 model with 939 miles on the odometer. The three graphs compare the OEM system, Area P Full Standard System, and new Area P Mid-High Mount Race System with 18" Muffler & Turn Down Exit Tip; all on the same test bike. The OEM airbox was removed, K&N Dual Flange Oval Air Filter and Crankcase Breather Element installed, Kleen System removed/plugged, along with *Area P/Dynojet Jet kit installed. The power increase is very strong from 3000 rpm to 12250 rpm. 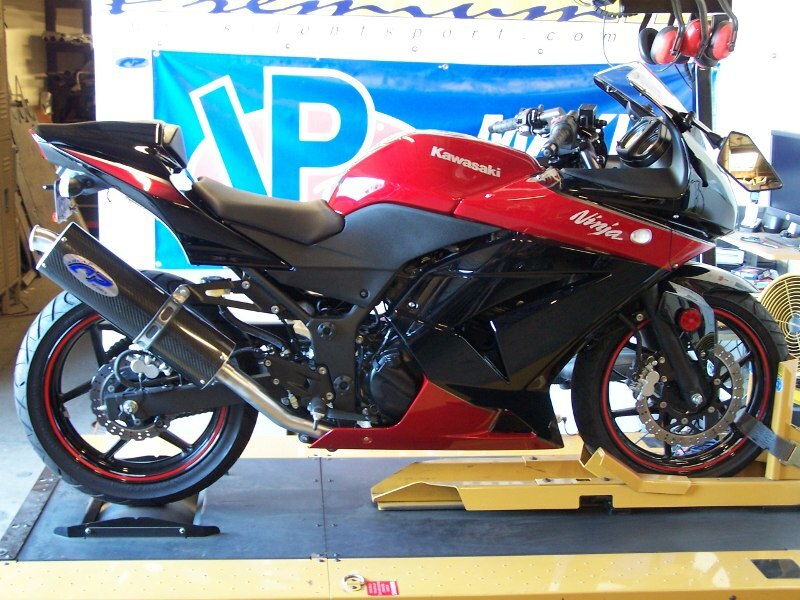 As noted, emphasis was primarily placed on throttle response and power above 8500 rpm to a peak of 12250 rpm. You will notice that at peak power (12250 rpm), the Race System is more than 10.5 hp (+33%) over the OEM exhaust, and 2.4 hp (+ 8%) over the Area P Standard system. Actual throttle response was also dramatically improved. Specific jetting instructions are included with the installation/tuning manual. *Area P customized Dynojet kit includes 3 additional sets of main jets, stainless steel Allen Head screws for carb top caps and float bowls, Allen wrench. 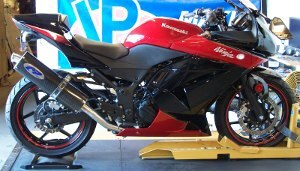 Primarily used when oem airbox is removed and replaced with K&N Dual Flange air filter and Crankcase breather element and/or Racing. For more information or to order, click here to contact us!